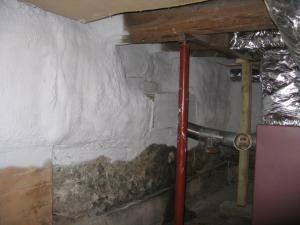 Does it matter who installs your basement insulation? When it comes to insulation, there are plenty of choices. Where to start? What to use? Who to hire? The answers vary from house to house – and from homeowner to homeowner – but if you work with someone you trust, you’ll be in good shape. Prepping the foundation walls before foaming. This often includes scraping and vacuuming dust, spider webs, etc. to ensure that foam adheres to the walls and performs its best. Maintaining negative pressure in your living space during foam installation. Any installer should run a fan in your basement to vent the vapors generated during SPF installation. Evergreen takes this standard ventilation a step further, maintaining a pressure difference that keeps basement air downstairs to ensure that off-gassing does not compromise the air quality of your living space. Running continuous ventilation for 72 hours after foam installation. We’ll continue ventilating your basement or crawlspace for as long as it takes for your spray foam to fully cure – up to 72 hours – to ensure safe indoor air. Coating exposed SPF with intumescent paint. This time-consuming step is required by fire safety codes; we ensure that it’s done right. Ensuring Efficiency Maine compliance. As an Efficiency Maine registered vendor, we deliver qualified improvements that earn you up to $1500 in incentives. These details make a huge difference in the performance and durability of your improvements and in your family's safety, so yes: it matters who installs your basement insulation. Contact us to start improving your home today.